Pleased to announce that the unlovely sheds thrown up on at short notice on Leyton Marsh – as part of the great festival of running and jumping – are gone. The deadline for removal was missed, and the area of public open land is still fenced off, but the sheds are gone. The ground is level and new – monocultural – turf is being laid. Pleased to announce that the unlovely sheds thrown up on at short notice on Leyton Marsh – as part of the great festival of running and jumping – are gone. The deadline for removal was missed, and the area of public open land is still fenced off, but the sheds are gone. The ground is level and new – monocultural – turf is being laid. I’ve been waiting for him to announce the good news, with some acid comments about the delay. ‘Bad weather’ is the given excuse, which didn’t seem to stop them getting the party ready on time? It’s always politic to congratulate people for doing what you want. Even when you’ve made them do it when they didn’t want to. Whenever you make a pushy MDV* wait for your priority always try and thank them. Patronising politeness is so much crueler than anger, and not giving them an outlet for their frustration might just leave them with space and energy to mature into a less selfish and desperate traveller? signalled the beginning of the end of the ‘Vanishing Tribe’ era, the first glimmer of dawn for the current epoch of Mixed Messages. Ron’s uncompromising stance on motor-danger and motor-slaughter is laudable. In an era when most commentators still moan about ‘dangerous roads’ or ‘nightmare traffic’ like they were natural phenomena – avalanche, hurricane, shark attack – Crap Cycling keeps the focus resolutely on human agency. The danger doesn’t come from cars or trucks or junctions or roads; it comes from people like you and me. But isn’t it possible to keep stating that obvious fact without denying the known epidemiological truth that people who ride bikes live longer? I’d like to ask Ron myself but he doesn’t take comments. The Greenwich Foot Tunnel is a nice amenity. It runs from the snout of the Isle of Dogs – actually a low lying peninsula – to the historic riverside town of Greenwich. It’s a useful link for people travelling by bike. The 250 metre walk between the foot of each shaft avoids a detour to Woolwich, Rotherhithe or Tower Bridge. The lifts at each end used to be staffed by apathetic attendants equipped with tabloid newspapers. The elevators didn’t run during the night so cycle-travellers had to yomp down and up the stairs cyclo-cross style. The Greenwich Foot Tunnel is a nice amenity. It runs from the snout of the Isle of Dogs – actually a low lying peninsula – to the historic riverside town of Greenwich. It’s a useful link for people travelling by bike. The 250 metre walk between the foot of each shaft avoids a detour to Woolwich, Rotherhithe or Tower Bridge. The lifts at each end used to be staffed by apathetic attendants equipped with tabloid newspapers. The elevators didn’t run during the night so cycle-travellers had to yomp down and up the stairs cyclo-cross style. Bike riding has never been permitted in the tunnel, although in dead of night there was no problem with pedalling softly through the neon-lit tube. Predictably some knobs insist on trying to ride when the tunnel is populated or even busy with tourists. A hobby of mine is accidentally-on-purpose offering mild – faux-absent-minded – threats of obstruction to enjoy these cowboys’ affronted reactions; active citizenship in action. The Tunnel is undergoing prolonged restoration. New lifts were installed in advance of the ‘lympics. They’re un-staffed and work 24×7. Not having to consult a timetable when taking a heavy laden bike, or towing a trailer, is progress. The sad part is that – in reaction to those who try and ride through when traffic-conditions are inappropriate – the elegant corridor has been defaced with two sets of these ugly railings…. The chicanes the barriers create cause congestion when pedestrian flows are high. It’s inconvenient for people in wheelchairs, those pushing baby-carriages or walking tandems or other over-length vehicles. The fences are adorned with the traffic sign; ‘CYCLISTS DISMOUNT’. This sign means ‘no cycling’. don’t address the nuisance of people trying to cycle when it’s inappropriate. A classic example of not solving a problem just putting a new problem on top of the old one. The blue ‘dismount’ signs probably encourage some of those, too thick to understand that riding when people are walking through is a nuisance, to think that riding is OK? ‘Official’ signs asking them to get off at a couple of points along the corridor suggest that you’re allowed to – even supposed to – be riding the rest. Motor-free movement space isn’t valued in our current transport-economy. A little light enforcement of the ban on cycling. a few well-publicised penalty tickets – it wouldn’t be hard to trap any runaways and the CCTV pictures will be nicely lit at any time of day – a campaign to embolded brave and public-spirited pedestrians to obstruct anyone trying to ride; are all considered too much trouble, why not just put up some fences and piss everyone off? Thirty years ago somebody explained to me a principle – imported from the ‘bicycling countries’ of Northern Europe – that conflict between pedestrian-traffic and cycle-traffic is usually a symptom that conditions for one or both are inadequate. The indoor space of an Edwardian tunnel is no exception to this, but – over this short distance – extra capacity can’t be won easily. The Sint Anna Tunnel under the Schelde from Antwerp to Zwindrecht is a nice facility, where shared-use – between cycle and pedestrian traffic – works well, but the roadway is more than twice as wide and the ratio between vertical and horizontal capacity was specified with cycle traffic in mind. 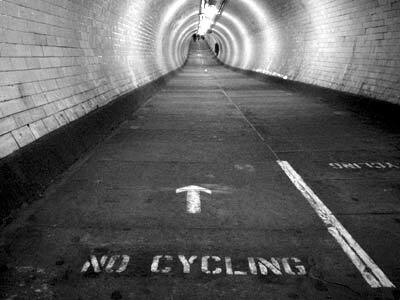 A second bore of the Greenwich Foot Tunnel – to accommodate ‘Look’ pedal-users – isn’t any kind of infrastructure priority but – hey – if we must have Grands Projets to kick-start the economy it would be better value than more pandering to under-priced air travel. Everyone is willing to agree that L.A. is not just a great riderbut was also a master of ‘scientific preparation’, we might expect Walsh and Kimmage’s dogged persistence – in the face of bullying and lawsuits – to be praised. The UCI‘s denouncement of Lance Armstrong vindicates Paul Kimmage and David Walsh. …everyone is willing to agree that L.A. is not just a great rider but was also a master of ‘scientific preparation’, we might expect Walsh and Kimmage’s dogged persistence – in the face of bullying and lawsuits – to be praised. The UCI are, however, persisting with a case for defamation against Kimmage. Their action is against Paul Kimmage in person which can only be interpreted as an attempt to silence him. When Armstrong went after David Walsh he at least had the dignity to sue his mighty publisher. This gives us all a chance to participate in the clean-up operation from our armchairs. It is – of course – a mistake to deduce a causal relationship from a correlation but you may have noticed… 27/09/2012: owntheroad.cc demands the resignation of Andrew Mitchell… 19/10/2012: Andrew Mitchell resigns… Potty-mouth Mitchell has been replaced by man-of-the-people Sir George Samuel Knatchbull Young 6th Baronet, CH. …27/09/2012: owntheroad.cc demands the resignation of Andrew Mitchell. Potty-mouth Mitchell has been replaced by man-of-the-people Sir George Samuel Knatchbull Young 6th Baronet, CH. Luckily George – ‘the bicycling baronet’*– had the wisdom and self-control to be nothing but courteous to the lowly police officers who busted him for drunk driving back in the long-gone, Thatcher-lovin’ 1980’s, when Lance Armstrong was a teenage triathlete, Jimmy Savile a national treasure and triple-chainrings exotic. *Social progress demands that George’s nickname be updated for the 21st Century. 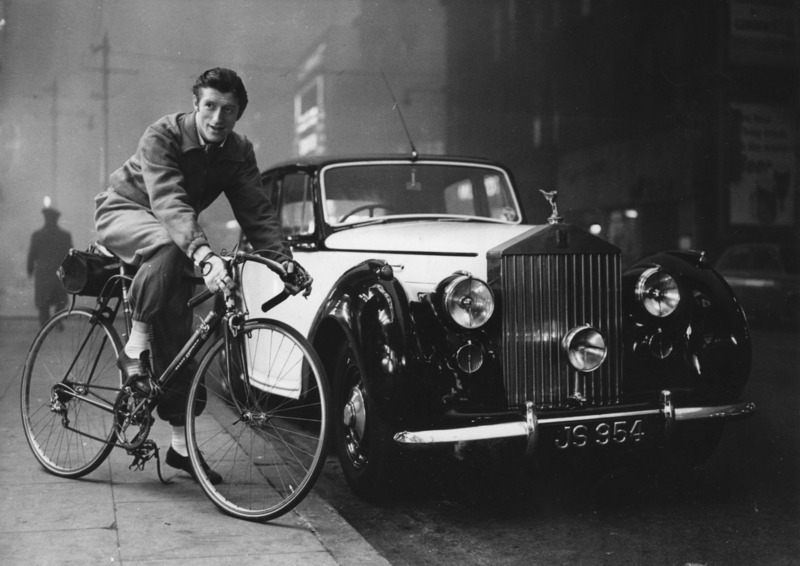 Due to changes in perception of appropriate behaviour for toffs in city centres Sir George’s use of the (insert compulsory adjective) humble bicycle is no longer worthy of comment and from now on he will be styled George ‘the baronet’ Young. Even as the myth of Lance Armstrongfinally crumbles to dust the reputation of a much less successful, ex-road-racer, who took every opportunity to associate with the powerful, and was known for good works, has also crashed hard. Play ‘times were different then‘ soundtrack. Abu Hamza al-Masri; a disabled war-veteran who lost an eye and a hand fighting to liberate Afghanistan from Soviet imperialism? 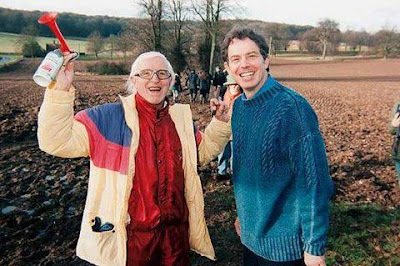 …but Jimmy ‘Oscar’ Savile may test that theory to breaking point? I always assumed his ‘charidee‘ work was an alibi for an absence of any discernible talent to entertain but now it’s clear that it also covered more sinister crimes. In the 1980’s I worked in show business and was told by a young actress, in an idle, time-filling, location conversation, that Savile – already an unfashionable, preposterous figure – “liked pushing little handicapped girls around”. A friend who worked with Anthony Newley who’d been a pop-star in the early 1960’s, passed on the gossip that, when Saville first came to London he was a pimp. With hearsay rampant how did the reputation of the nonce-case survive? How did he avoid exposure for more than fifty years? 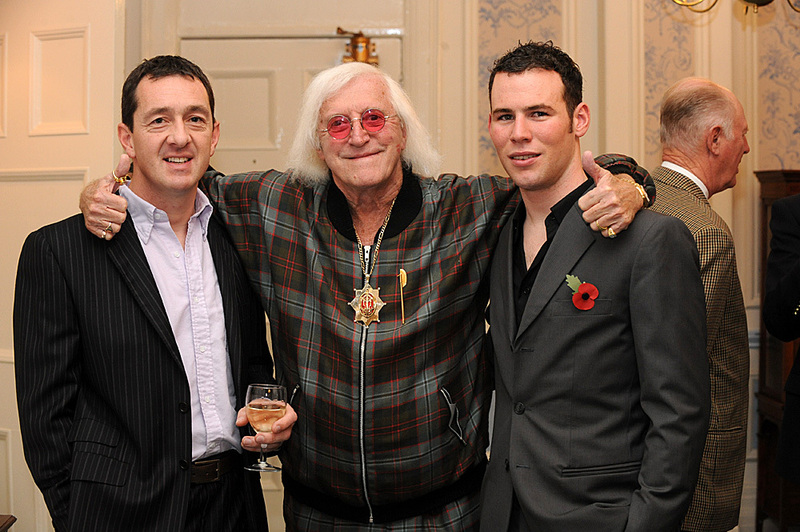 In asking this important question nobody has yet denounced the prolific kiddy-fiddler as a cyclist? Are Tony Parsons, Matthew Parris, Kate Hoey, Petronella Wyatt all on holiday? Way back in 2004 Greg Lemond was working on his autobiography with a great sense of urgency, certain that Lance Armstrong was about to be unmasked as a doper, a revelation Greg believed would kill-off interest in bike racing in the US, and consequently hurt the book’s sales. discovery – better late than never? All Armstrong’s major rivals, Pantani, Ullrich, Basso, Zülle, had problems with medical controls or were implicated in blood-doping. 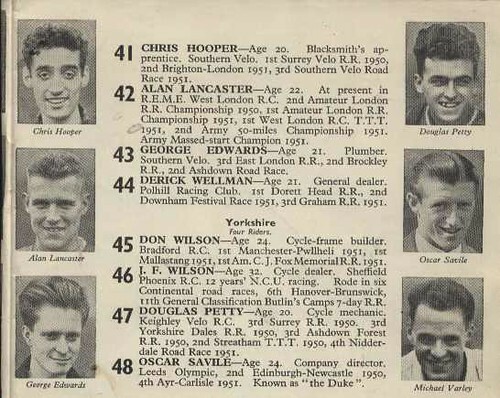 There’s another list of riders – Heras, Hamilton, Landis – who rode as Armstrong’s team-mates, departed to fend for themselves, then tested positive and were busted. As circumstantial evidence mounted an ominous question grew ever-more pressing. How – in an era when ‘scientific preparation’ was assumed to be widespread, sophisticated and systematic – did Lance Armstrong manage to dominate the World’s biggest stage race without ever testing positive? For years the most likely explanation seemed that Lance had sold his soul to the devil. In 1967 Jacques Anquetil broke the hour record, for the second time, covering 47.493 km in sixty painful minutes. The achievement was never ratified as he declined to give a sample to the medical control. His morally rigourous position – measure the track, check the watch but I am a professional, how I prepare is between me and my doctor – was echoed recently, in reference to l‘affaire Armstrong, by Malcolm Gladwell. They’re all on-it, why not make ‘scientific preparation’ another facet of the sport? Professional sport is never fair. Ever wondered why Ben Johnson ran for Canada not Jamaica? Cycle-sport – a product of the industrial age with no idealised pre-history – is least fair of all, it’s whole point, the employment of technology to increase human performance. Coca-cola sponsored the Tour-de-France while it’s main active ingredient – caffeine – was on the list of banned substances. It’s legal to sleep in a hypobaric chamber or train at high altitude but stockpiling your own blood for re-transfusion is forbidden. Sport needs rules, and cheating is bad, but the line between ‘positive’ and ‘clean’ is essentially arbitrary. Anquetil died of stomach cancer aged 53. The real issue is harm reduction. It’s not good for athletes to dose themselves with the latest medical developments simply to keep up in a pharmaceutical arms-race; but harm-reduction and cycle-sport have a problematic relationship. Racing bikes is dangerous. A career racing bikes is only for people who’ve made their peace with mortality. As Sean Kelly put it: “You don’t think about hospital you think about winning.” Who now cares if Casartelli, Kivilev or Weylandt were riding clean? Armstrong’s case has a further complication. His fanatical interest in pharmacology began in desperate self-preservation. Without medical technology the self confessed ‘cancer geek’ would be dead and wouldn’t have won the Tour de France even once. The question – ‘Is he clean?’ – has importance but only becomes preeminent in the shallow and chauvinistic reading of sport, as morally-uplifting. The true fan must ask rather: ‘Is he entertaining?’ ‘Does he put on a good show? The final judgement on the Armstrong years is not that they were corrupt or evil, they were just a bit less interesting than they might have been. Sport’s unique selling point is that the outcome is supposed to be unpredictable. King Lear may be dramatic but if you’ve seen it once you’ll never be surprised by its denouement again. The one thing large organisations of all stripes – from Nike, Inc. to the Communist Party of the People’s Republic of China – have in common is a strong dislike of uncertainty. Lance cultivated powerful friends and allies; associates who wanted some of his glory, his manifest personal power, reflected on them. These individuals and organisations all understand that the difference between good and evil is not so important or clear as the simple-minded narratives they offer us. One reason Lance stayed ‘good’ for so long is that – even when evidence to the contrary was starring them square in the face – a lot of powerful people and organisations wanted him to be. Bicycle road racing – the true monarch of sports – has no moral value but it’s worthy of study; full of parables. Is Lance villain or victim? For anyone who doubts we are living in the era of mixed messages consider this un-photoshopped image, captured in Stanhope Gardens, London, N4, 29/09/2012. Let me make a bold prediction. There will be pneumatic tyres on suitcases within ten years. Think about it? Wheels on luggage used to be quite a novelty now they’re everywhere. 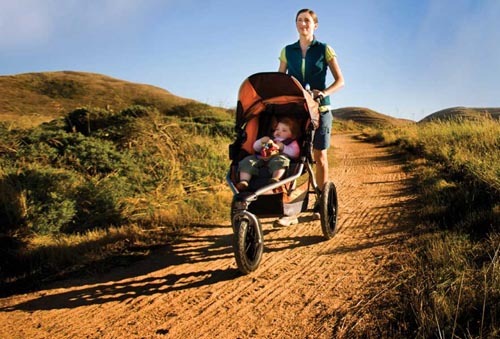 Baby carriages – once sedate appliances with leaf springs – are now available with puncture possibility. Where will it end? We can divide the World’s population into two categories, those who understand how to fit pneumatic tyres and those who do not. Key information is in the three digit element of the ISO number etched on your tyres ‘622’, ‘559’, ‘406’ or whatever. These numbers are not much used in England, where ignorance of technical matters is often worn as a badge of honour. Here people prefer to use the historic designations – ‘700c’, ’26 inches’, etc. – of a tyre’s diameter. The problem with these is they aren’t definitive. According to the late, great Sheldon Brown who – as usual – provides the most comprehensive explanation of the subject, there are seven(SEVEN) unique, non-interchangeable tyre sizes that may be marked with the diameter ’26’. “Sorry we only do BMX.” He replied. In his defence when I explained – gently I hope – that 406 is BMX, he took it on the chin saying: “Oh yeah, I’ve seen those numbers on the boxes” and thanked me for the clarification as he took my cash and handed over the rubber. This three digit element – ‘630’, ‘590’ ‘349’, or whatever – is known as the BSD – a TLA* standing for ‘bead seat diameter’. The ‘beads’ are the wires around the inside edges of the tyre. BSD is the inside diameter of the tyre and also the diameter of the circle on the rim where the tyre beads sit when in use. The centre of the rim – the ‘well’ of the rim – will always be nearer the centre of the wheel, and a smaller circle than the bead seat. In order to fit a tyre on a rim you have to control the bead with tension so it stays along the shorter circle of the rim well. This generates enough slack to flip the last section of tyre bead over the rim wall. People who think fitting tyres is hard don’t know how to do it. There’s no shame in this. Nobody is born knowing how to mount a tyre on a rim. The problem has lately been exacerbated by ‘puncture proof tyres’. Some of these are so rigid that – as well as giving a slow and uncomfortable ride – they are harder to fit. A pneumatic tyre is already a Faustian bargain. You get to ride on air, but will also suffer random punctures. Nasty armoured tyres raise the stakes of this gamble. They mean you are less likely to get a flat, but when you do it will be harder to get the tyre off to change the tube and more of a challenge to get it back on. If you understood the above – and didn’t know it before – you are now on the way to joining the minority group, the people who know how to fit tyres without hurting their fingers or losing their sang-froid. This minority divides into those who can fit tyres but don’t have the conscious competence to explain to others how it’s done, those who know how they do it but want to keep that knowledge secret. If you can charge others £17.50 to undertake a simple task on their behalf, and you’re not able to do much else, why would you want to give them the secret of doing it for themselves? Others among the cognoscent are so desperate to drag the innocent down to their own tragic level of bicycle-dependence that they give the secret away freely. Readers of the Guardian online may have noticed this item on Monday’s front page, a link to free content, moving pictures with audio commentary and written notes, from MadeGood.org. 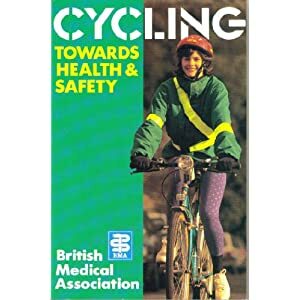 I’m proud to be a collaborator on this project to spread knowledge of, and confidence in, the simple – not rocket-science – subject of keeping push-bikes running sweetly. This directory of instructional films will soon be enlarged. The plan is to make the library comprehensive and keep it updated. Off course some people – especially young men with old men’s beards – will find plenty of weak spots in this work-in-progress. But hey, it’s free, and you have to start somewhere. Punctures are part of riding a bike, and the first twenty are the worst. *TLA = three letter abbreviation. So it turns out that last week’s bold assertion…”nobody has denounced Andrew Mitchell as a cyclist” was contradicted by a classic ‘will this do?’ space-filler from Tony Parsons, who is mostly known for being Julie Burchill‘s child bride and his sub-Hornby formula novels. Doubtless Tony is tortured with envy and disappointment that he can’t follow his peer group onto high-end bikes without looking like he’s wheel-sucking Robert Elms. …was contradicted by a classic ‘will this do?’ space-filler from Tony Parsons, who is mostly known for being Julie Burchill‘s child bride and his sub-Hornby formula novels. Doubtless Tony is tortured with envy and disappointment that he can’t follow his peer group onto high-end bikes without looking like he’s wheel-sucking Robert Elms. It just goes to show that in this era of mixed messages not everyone is keeping up.